Featuring Les Paul Jr. and Explorer plus PRO-1 Innovations, MityPRO™ amp and more! 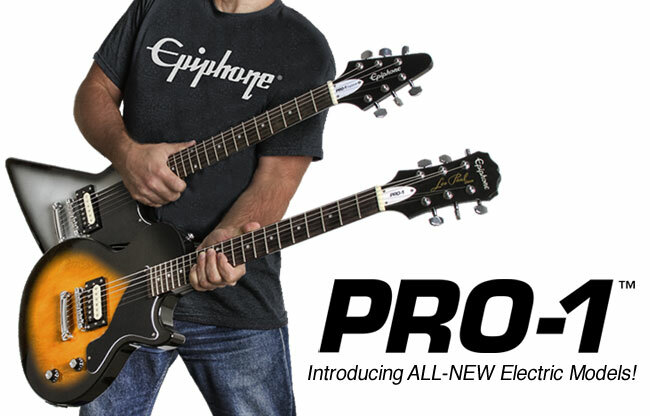 Epiphone introduces the new PRO-1™ Performance Pack featuring the PRO-1 Les Paul Jr. and the PRO-1 Explorer. Each PRO-1 Performance Pack also comes with Rocksmith, the fastest way to learn guitar, for the ultimate electric pack for new players. 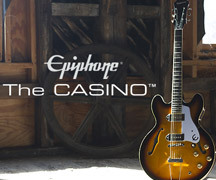 Epiphone Packs are renowned for giving players incredible value in an all-in-one package. And the new PRO-1 Explorer Performance Pack tops them all! PRO-1 Performance Packs come with all the PRO-1 series' innovative features including an EZ-PRO™ C-shaped Neck, Ultra-Light strings, plus an exclusive Built-In Shadow® E-Tuner on the bridge pickup mounting ring. And with Rocksmith plus the included Real Tone cable (a $79 value), you can plug-in to the revolutionary video experience that since 2011 has taught millions around the world to play guitar while also offering a superior sound experience with built-in digital effects through either a PC or MAC that blows away most small amps found in other packs. The new Epiphone PRO-1™ Performance Packs also features a cool Epiphone MityPRO™ Mini-Amplifier with built-in distortion powered by a 9V battery. Plus, the Packs come with free eMedia™ online lessons, a Beginner's Guide to Guitar by guitar and tech guru Craig Anderton, and a deluxe fitted gigbag. 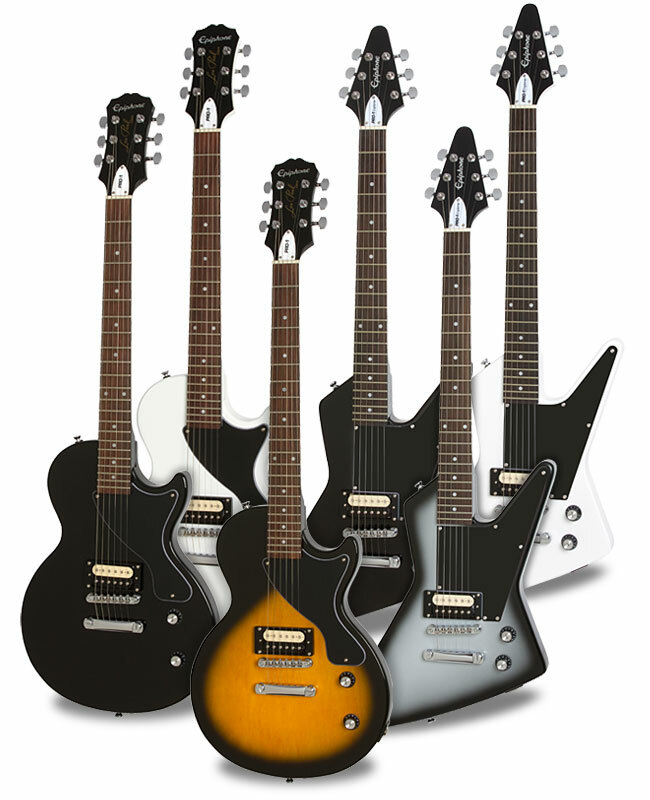 All together, PRO-1 Performance Packs offer unbeatable value you can only get from Epiphone! The PRO-1 Les Paul Jr. features the world famous Les Paul profile made with a Mahogany body and Hard Maple Neck and has a powerful Epiphone Ceramic 700T™ Zebra-coil humbucker with an easy to use built-in Shadow® E-Tuner on the pickup mounting ring. Your PRO-1 Les Paul Jr. gets in tune and stays in tune easily thanks to Epiphone's legendary Tune-o-Matic™ bridge and the same Premium diecast 18:1 ratio tuners found on all PRO-1 instruments. The PRO-1 Les Paul Jr. is available in three classic finishes: Alpine White, Ebony, and Vintage Sunburst. The PRO-1 Explorer has the same profile of the timeless rock and roll classic but sized smaller for the PRO-1 family with a Mahogany body and Hard Maple Neck. The Explorer is powered by an awesome Epiphone Ceramic 700T™ Zebra-coil humbucker with an easy to use built-in Shadow® E-Tuner on the pickup mounting ring. Tuning is fast and rock solid with Epiphone's legendary Tune-o-Matic™ bridge and the same Premium 18:1 ratio tuners found on the Les Paul Jr. and all PRO-1 instruments. And like the PRO-1 Les Paul Jr., the new PRO-1 Explorer is available in three classic finishes: Alpine White, Ebony, and Vintage Sunburst. And, when you're not plugged in to Rocksmith, you can plug your Les Paul Jr. or Explorer into a MityPRO™ Mini-Amplifier with built-in distortion, Master Tone and Volume, a standard ¼" instrument input, an MP3 input, and a headphone output. 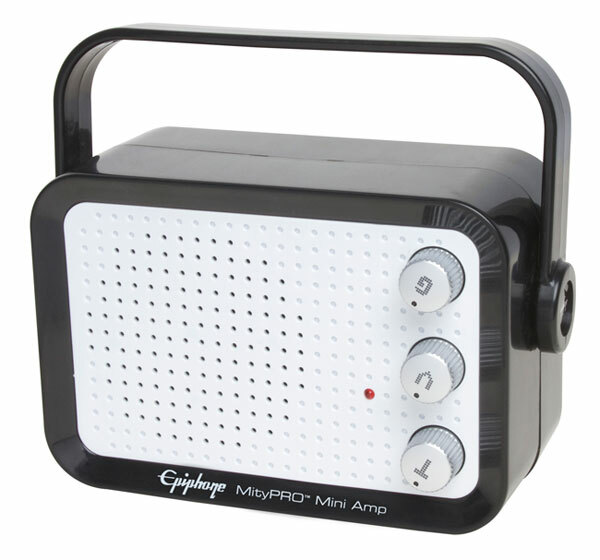 Its 9V battery (with optional AC/DC power) allows you to practice or perform just about anywhere. The new PRO-1 Performance Packs are part of the critically acclaimed PRO-1 series designed by pros to make learning guitar fast and easy. PRO-1 guitars are not just new ground-breaking "student" guitars, but a new line of totally "pro" instruments that combine classic styling and bold new features that make them easy to play from the first note. As Guitar Player said of the PRO-1 in their 2014 Editor’s Pick: "Everything just works, and it works in a way that seduces you into playing for long spells without fatigue, cramping, or the slightest bit of frustration." 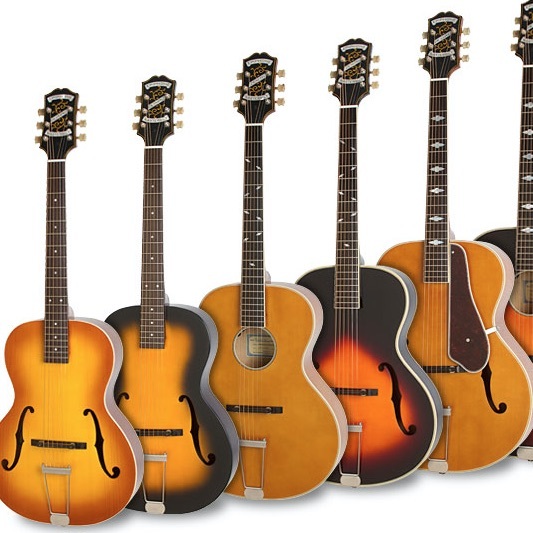 Drawing on over 140 years of experience, the Epiphone PRO-1 Collection of acoustic and electric guitars are easy for players to get started on. And all PRO-1 guitars have the same full, vibrant sound that Epiphone is known for. 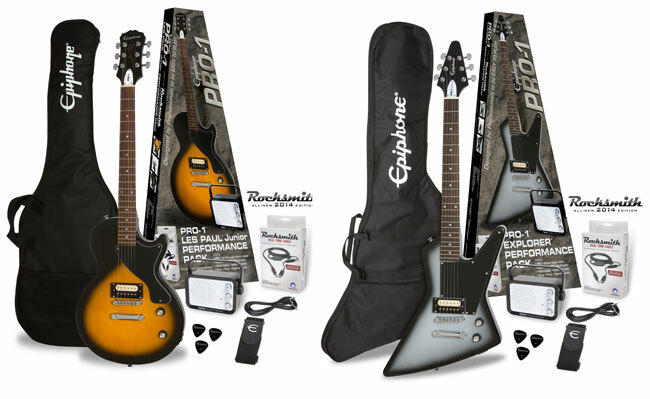 Epiphone PRO-1 Performance Packs also come with Rocksmith (Free Download; Internet connection required), the next step in the Plug and Play Revolution that since 2011 has taught over a million people around the world how to learn to play guitar by plugging in their own Epiphone guitar! Using your Real Tone cable (included), plug your Les Paul Jr. or Explorer into Rocksmith and enjoy a newly redesigned menu and in-game interfaces. It's never been easier to play along and get feedback on your performance. Learn your favorite songs FAST from a selection of 50 hit tracks ranging from alternative rock to heavy metal and more. Like all Epiphone instruments, PRO-1 Performance Packs come with Epiphone's Limited Lifetime Warranty plus Gibson 24/7/365 Customer Service. Visit your Authorized Epiphone Dealer today and discover the world of music, the Epiphone Way with the new Epiphone PRO-1 Performance Pack featuring the PRO-1 Les Paul Jr. and the PRO-1 Explorer with Rocksmith!